In an alternate universe, Mighty No. 9 was phenomenal. It shattered sales records, was showered with critical acclaim, and it became a franchise worthy of spinoffs and an anime series. Alas, the product that we got last year was disappointing at best and downright abysmal at worst. However, not wanting to let Beck’s story go to waste, Inti Creates developed Mighty Gunvolt Burst, a crossover with Mighty No. 9 and Azure Striker Gunvolt. It seems that this game is the true successor to Mega Man-inspired gameplay, and a great Switch title to boot. Alright Beck, you already disappointed us last year. Don’t make me cry like an anime fan on prom night! 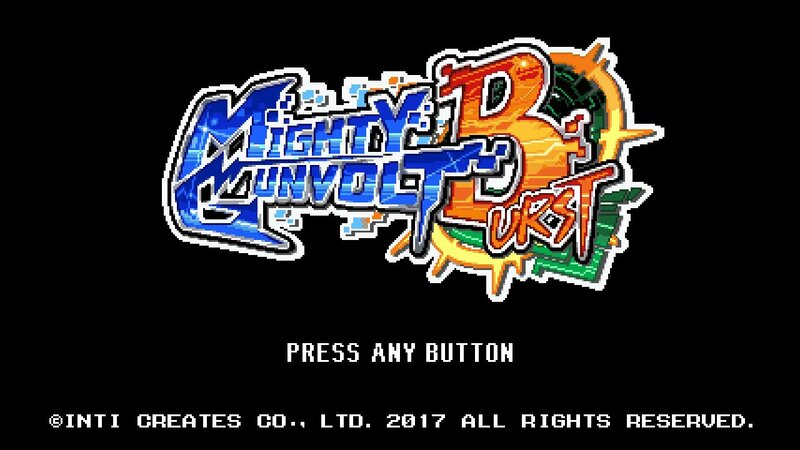 A pseudo-sequel to 2014’s Mighty Gunvolt, Burst puts Beck and Gunvolt together to stop an unknown threat from a VR simulation gone haywire or a sinister robot tournament (depending on which character you pick from the beginning). After you select your protagonist, you’re dropped into an intro stage that eases you into run-and-gun mechanics, plus a new burst feature: by destroying enemies at point-blank range, you’ll be able to rack up a burst combo that stays with you until you fail to defeat an enemy up close. Eight stages open up afterwards, with a corrupted Mighty Number boss at the end of each, and you’re free to choose how to tackle them. I can’t beat Air Man! I can’t dodge his tornadoes no matter how many times I try. The game is a loving homage to the Mega Man games of the NES era (as well as the Wii’s 9th and 10th titles), and the graphics are bright and detailed enough to feel decidedly 80s. Much like Blaster Master Zero, Mighty Gunvolt Burst has a unique 8-bit style and charm to it, and the Switch really makes the pixels pop. However, it also takes its unique features and heightens the experience to something greater than Mighty No. 9’s source material. Unlike Beck’s console debut, the game has a great sense of speed and isn’t hindered by enemies littering the screens (for the most part, which will be explained later). It helps that both protagonists zip around at a pretty quick pace as well. The controls are tight and responsive, and feel right at home with the Joy-Con’s analog stick. Road Rage in the future? More like Top 10 anime battles. What makes this game stand out, however, is in its customization system. Throughout the different stages, you’ll collect CP items that will allow you to customize your standard bullet spread and character movement. Beck is naturally the one to receive more upgrades through this system, but Gunvolt has unique powers that you can use from his home series.. Both protagonists have their advantages, and you can change almost everything about your character, from the trajectory of bullets to damage taken from enemy fire. (I personally prefer Gunvolt over Beck due to his superior air ability and slightly overpowered septimal powers). There are hundreds of combinations you can use, but at first, most options are locked away. In order to get them, you’ll have to find hidden paths or defeat bosses in order to obtain them, and then have enough CP to equip the customization. While this would normally feel like a drag to unlock and grind CP, these items are permanently unlocked when you collect them, so even if you exit a stage prematurely, it’ll be available to use the next time around. This means that if you’re ever stuck on some tricky bosses, all you need to do is travel to different stages collecting the right powerup to dispatch your opponents. This gives a sense of progression that I haven’t really experienced in Mega Man games (as losing all lives in one of the main games generally means starting over from the beginning of the stage). There are a few deviations from the classic Mega Man formula that really helps with longevity. Like Mighty No. 9, you’re given a grade after every cleared stage, from D to S+. You’ll be graded on things like time spent beating the stage to how many times you died (the game offers unlimited continues and a good amount of checkpoints, which is a godsend for platformers like these). Online leaderboards would’ve been a nice touch for this game, but as it stands, the regular scoring system works well enough. While each stage with a Mighty Number offers an ability to obtain (so you can exploit another boss’s weakness ala Mega Man), there’s also a huge CP pickup and an avatar sticker you can choose, but you can only select one. You’ll have to repeat a stage in order to get the other rewards, but the stages are short enough where this feels more of a treat than a retread. I found that I would usually miss a few hidden items on my first playthrough in a stage, so I could play it again easily to grab the things I missed and pick up some more CP upgrades to change my current shot spread. It’s a lovely and innovative way to revisit levels, since there’s a tangible, meaningful reward for doing so. It doesn’t seem like much, but a huge CP pickup could mean the difference between struggling against or one-shotting the next boss. While the game can be finished in around 2 hours, there are additional challenges you can try in order to grab some extra avatar stickers, such as completing a stage using a certain bullet type or clearing a stage without taking damage. Fun fact: You can either put an “ice to meet you” joke or a Negan and Lucille reference and it STILL would be overused! The new Beauty and the Beast live-action remake looks nice. The biggest fault with Mighty Gunvolt Burst lies in the third word of that title. While the game is great when it inches past its Mega Man-inspired identity, the one new feature, the Burst mechanic, is something that ruins its fun at times. Because it’s dependent on player distance in relation to an enemy, the risk-vs-reward system is in play here. You could try and grab another combo in order to score post-stage points, but at the danger of getting hit and sometimes even falling to your death. It doesn’t help that the game encourages this risky behavior, and thus renders a lot of long-ranged builds pointless for higher scores. You won’t even know when you get a burst combo until you destroy an enemy, which can end up being super frustrating if you break a combo when you swear you were close enough. It’s not an entertaining mechanic, and much like the Xel gimmick in Mighty No. 9, makes the ride feel cumbersome and slow. In addition to that, the level design can be annoying at times, with enemies popping up at inopportune times above bottomless pits or insta-kill spikes, but that’s really just a Mega Man staple. Mighty Gunvolt Burst is everything that Mighty No. 9 should’ve been last year. Its excellent retro style, deep customization features, and rewarding progression system pave the way for a fast-paced, fulfilling experience.